I love pavlovas. So simple yet so versatile. As a food photographer, one of your worst fears is working hard on something and then either dropping it or you know.. the (heavy) backdrop falls straight onto the cake/cupcakes/whatever you’re making. The latter is exactly what happened to this cake (after about 15 photos). I would have been devastated had I put more effort into it. Luckily I hadn’t. I just sighed and shrugged my shoulders thinking, “I’ll put it in the freezer and eat it when I get home”. So I did, and boy was it delicious. Flat, but delicious. 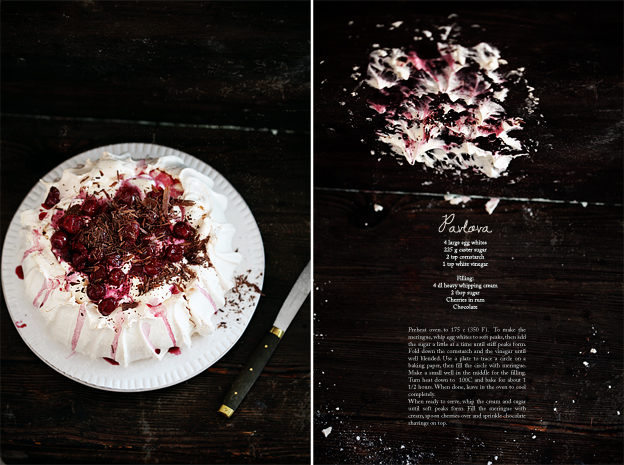 This is a basic pavlova recipe. You can use anything you like really, it doesn’t have to be cherries in rum! You can make the meringue a several days ahead, but I recommend filling it just before serving (or a couple of hours before) or it will lose its crispness. Preheat oven to 175 c (350 F). To make the meringue, whip egg whites to soft peaks, then add the sugar a little at a time until stiff peaks form. Fold down the cornstarch and the vinegar until well blended. Use a plate to trace a circle on a baking paper, then fill the circle with meringue. Make a small well in the middle for the filling. Turn heat down to 100C and bake for about 1 1/2 hours. When done, leave in the oven to cool completely. When ready to serve, whip the cream and sugar until soft peaks form. Fill the meringue with cream, spoon cherries over and sprinkle chocolate shavings on top.